What California needs now is a good Pinot Noir priced under $20. I recently visited a number of high volume wine retailers like Total Wine & More and BevMo and obtained Pinot Noirs from primarily recognized producers throughout California, all but two priced under $20. Many of these wines carry a suggested retail price above $20, but are usually available for less at high volume retail stores which often operate on margins of 15% markup or less. Once you have fawned over premium California Pinot Noirs, it is hard to go back to valuepriced wines. The current economic downtown, however, will force many to seek out recession-busting Pinot Noirs for daily drinking. Finding good Pinot Noirs for under $20 is challenging. Winemakers I asked told me there are a number of practical reasons why it is difficult to produce good inexpensive Pinot Noir. Pinot Noir grapes are expensive (often $3,000 to $6,000 per ton depending on the region and vineyard - 1 ton equals +/- 60 cases), forcing value producers to seek out Pinot Noir that is grown in less than ideal areas (including foreign sources such as Corsica) or sourcing vineyards that are somewhat neglected and pay less than the Grape Crush Report weighted average pricing. There is an enormous cost of farming quality Pinot Noir grapes including the necessity of vineyard consultants and this cost must be passed on to the winery. The winery has costs and profit margins to meet and they usually account for 50% of the FOB (freight on board or price of the wine delivered to a wholesaler at a specific location) or 25% of retail cost. Packaging alone adds $20-$25 to the cost of every case. The wine is sold to the distributor at the FOB price. The distributor increases it by up to 50% of their cost, and sells it to the retailer who in turn marks the wine up by anywhere from 12%-50% of their price. By the time the bottle has arrived on the shelf in California, it is a wonder there are any Pinot Noirs priced under $20! Wineries can cut corners in many ways. It is not unusual for value producers to blend in up to 25% of some cheaper, preferably darker, wine into the finished wine (legal in California but if it is an appellation-designated Pinot Noir, the cheaper blending wine is limited to 15% instead of 25%). Wine can be bought off the bulk wine market to reduce production costs. The current bulk market price of California Pinot Noir is about $25 per gallon which translates to a cost of wine of $60 per case. If you add in bottling and packaging costs at $40 per case, it is possible to get a Pinot Noir to the selling point of $100 per case. After the distributor takes his cut, the retailer would pay $160 for this case of Pinot Noir and sell it for less than $20 a bottle. Buying Pinot Noir grapes and having them custom crushed would yield a similar cost per case ($4,000 per ton for grapes, $1,000 per ton to crush and ferment, more to age, bottle and package gets you to the same case selling point). Oak alternatives such as staves can be substituted for new oak barrels to reduce costs. At Purple Wine Co. (Mark West Pinot Noir), winemaker Alex Cose adds a small amount of amply oaked Chardonnay to his Pinot Noir to obtain more oak notes. In most cases, a large winery facility capable of producing high volumes is necessary to produce inexpensive Pinot Noir as large capitalization is involved. The more wine you make, the lower your per bottle costs for everything. Wineries that own their own vineyards have a distinct advantage. The buyer should be aware of several caveats when buying under $20 Pinot Noir. The wines are rarely singlevineyard designated Pinot Noirs. As noted above, other varieties, particularly Syrah and Petit Sirah, can be added to the finished wine. This may or may not be indicated on the label. “Produced and Bottled By” indicates the named winery on the label actually made and bottled the wine inside. “Cellared and Bottled By” indicates at least some or maybe all the wine came from outside sources and was aged at the winery’s facility. The wines often carry a general California appellation indicating grapes and or wine were obtained from multiple wine producing regions of California rather than a more specific appellation. The wines are often more manipulated, receive color, acid and tannin additives, and are frequently fined and filtered. Aging in barrels may be limited and the wine may be released shortly after bottling. All that said, among the 24 wines I sampled I found a few California Pinot Noirs priced under $20 to be quite appealing and several others that were very ordinary but quite drinkable. I did not find one wine that had serious defects or was unpalatable, but I only chose to sample wines from wineries I was familiar with that had a track record for respectability. Generally, the closer to $20 the wine was priced, the better the quality. The wines were all varietally correct. None of the wines was truly exciting. Oak aromas and flavors often outdueled the fruit. The mid palate was often shallow and the finish short. The wines tended to lose their allure somewhat quickly in the glass, rather than gaining in character and nuances. I found some solid daily drinkers among the lineup of wines tasted that were readily accessible and I would urge you to supplement your highend purchases with a few of these recommended Pinot Noirs. This can be particularly advantageous when your thirsty relatives show up over the Holidays and begin peering with envy at your well-stocked cellar. Note: two of the wines in this category are priced slightly over $20, but worth the extra two bucks. 14.7% alc., 1,065 cases, $21.50. From estate vineyards in the Gavilan Mountain Range in Monterey County (Chalone AVA). Well-drained soils rich in limestone, with limited rainfall and low crop levels. · Hi-toned mineral-inflected cherries on the nose. Deftly oaked redder fruits in the mouth with well-defined raspberry notes and a hint of raisin. Nice richness on the palate and quite satisfying. This wine is a steal considering the respected heritage of this winery. Chalone also has a Monterey County bottling (Chalone Monterey) priced at about $12, but it is not totally from estate fruit. I did not sample it. 14.5% alc., $15 ($23 at winery). Sourced from estate vineyards MontereyCounty. The label sports a rooster (“hahn” in German). Aged 10 months in 65% new French oak. · Initially there is a lovely cherry scented nose with accents of earth, clove and smoke. With time in the glass, smoky oak dominates the fruit. Medium-weighted sweet black cherry fruit is accented with raspberry, raisin and even pear. Silky textured and nicely balanced with moderate length to the appealing finish. 13.8% alc., 3,544 cases. $19 ($26 at winery). 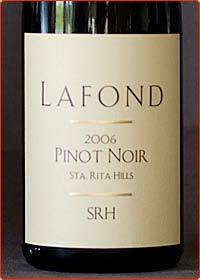 92% Lafond Vineyard, 8% Arita Hills Vineyard. 6 different Pinot Noir clones. Aged in 25% new French oak. The winemaker is Bruce McGuire. · Really charming aromatics featuring bright cherry, Indian spices and a hint of pepper building in intensity in the glass. The attack leads with a full-on charge of tart cherry fruit that is fresh and satisfying. The tannins are fine and supple and the finish leaves a lingering berry-toned aromatic impression. Beautifully balanced and tres Pinot. The best wine among the under $20 recession-busting Pinots tasted. 14.3% alc., $22. 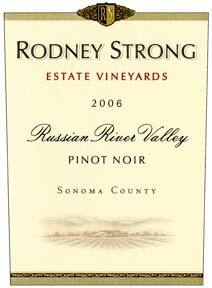 Rodney Strong is a very large producer of multiple varieties of wine from Sonoma County vineyards. The Pinot Noir program has been very impressive of late. The accomplished winemaker is Rick Sayre. 3% Syrah. Aged 9 months in French oak barrels. · Moderately light reddish-purple color. Demure red cherry perfume with subtle oak aromas. Appealing bolt of red cherry fruit on entry. Refined and persistent in the mouth with fine-grain tannins and a slightly dry finish. I would be perfectly happy with this wine at dinner. A Reserve is also available at $35. 13.9% alc., $16. “Rock solid wines” from San Luis Obispo County vineyards. Produced by Talley Family Winery. · Attractive deep cherry and berry fruited nose with an echo of oak. Tasty deeply colored fruits with a touch of herbs and a hint of citrus on the finish. Very refined, smooth and well-crafted. 14.4% alc., $19. Estate produced and bottled. · Well-oaked cherry fruit with herbal overtones carrying through in the flavors. Noticeably toasty. Clean and precise with soft tannins. Matches up nicely with grilled lamb. 13.7% alc., $12. From 45-year-old organically farmed vines in the Redwood Valley AVA of Mendocino County. · Complex aromatic profile of candied apple, new oak, new mown grass and orange peel. The wooded red fruit is soft and light on the palate. Supple tannins make for easy drinking. 13.5% alc., $15. 100% Pinot Noir. Aged 7 months in 33% new oak barrels. · Scent of rich, ripe strawberry jam with a hint of new oak. Very ripe verging on stewed fruit flavors with a touch of mocha dust. Light and restrained with admirable finesse and balance. 13.9% alc., $16. · Moderately light reddish-purple color. A cherrydriven wine that is medium-weighted offering tangy fruit flavors enhanced by a touch of spice. The oak is well integrated, the texture is silky and the finish is dry and refreshing. Noticeably less tannic than typical Sonoma Coast Pinot Noirs and more akin to Russian River Valley Pinot Noir bottlings. 13.8% alc., $9. Fruit is sourced from coastal appellations. Produced at Purple Wine Co. in Graton (Russian River Valley). Fermented in small tanks after gentle crushing and punch downs and pressed lightly. Aged in French and Hungarian oak barrels for 8 months. The winery’s manifesto is “Get affordable Pinot into as many hands as we can.” The slogan, “Pinot for the People,” is an extension of this goal. · Pleasing fruit aromas of strawberries, cassis, and red Juju B’s, with a mild oak overlay. Aromas do not hold up well with time in the glass. Good berry and cherry fruit flavors with subtle accents of oak, char and herbs finishing dry and clean with decent length. Great value. 13.5% alc., $10. Produced by Muirwood Vineyards in San Martin, CA. Six Pinot Noir clones, aged in new and seasoned French oak. · Deep red fruits with overpowering oak char on the nose. Darker cherry and berry fruit flavors that are soft on the palate and clean on the finish. Once you get by the nose, it is a pretty good drink for the money. 14.4% alc., $19. Paraiso (pa-rye-zo) is the name given to the mountainside by early Spanish explorers where the Smith family has lived for 35 years on a sustainably farmed vineyard. · This wine shows the dark side of Pinot Noir. Deep ruby color. Restrained and brooding scents of dark Pinot fruits, black tea, and earth. 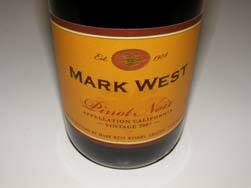 Sweet plum sauce on the palate with some richness, a velvety mouth feel, and a smooth and tangy finish. 13.5% alc., $10. 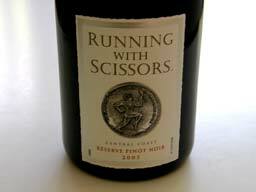 The name and tag line onback label are worth the price: “Running With Scissors Pinot Noir...Do try this at home.” · Light crimson color. Shy aromas of cherries and cranberries and a hint of alcohol. A lighter-weighted wine with pleasant cherry and strawberry flavors accented with oak and savory herbs. Decent acidity and a clean finish. Tastes a lot better than it smells. 13.9% alc., $12.50. · Funky nose of fresh-sawn oak, redwood, herbs and pineapple (due to some VA). Moderate amount of black cherry fruit smoothly presented with a sidecar of oak toast and herbs. 13.5% alc., $20. 76% Pinot Noir, 24% Mondeuse. · Darkly fruited nose with a touch of chocolate fudge, barnyard and hay. Juicy nondescript dark fruit with a hint of pepper, char and tea flavors. Nicely crafted with decent acidity for the table, but veers away from the typical Pinot Noir flavor profile. 13.5% alc., $9. · Well-oaked, earth-dusted black cherry fruit with some herbs and stem evident and a definite citrus strike to the finish. Pleasant and drinkable. A Reserve bottling is also available ($19). 14.2% alc., $12. · Smoky cherry-berry fruits with a little good Pinot funk and whiff of oak char on the nose leading to simple and shallow fruit in the mouth that is sensibly balanced with soft tannins and reasonable acidity. 14.0% alc., $15. Produced by Carmel Road Winery in Soledad and bottled at Carmel Road Winery in Santa Rosa. · Darkly colored. The nose is not appealing with oak, tobacco and herbs dominating the dark fruit in the background. Earthy blackberry and plum fruit with a coat of mocha dust. The finish is dry, tart and short. 13.8% alc., $10. · Lightly colored and weighted with very shy smoky cherry aromas and soft simple red fruits on the palate. Respectable for its elegance and softness and its loyalty to the charm of the varietal, but lacks interest and flavor punch. 13.5% alc., $18. · The appealing aromas trump the flavors in this wine. Nice black cherry, earth and cola scents. The dark cherry fruit is nicely presented on a silky platform with a clean and dry finish, but a dirty oak and stemmy taste spoils the ending. 13.5% alc., $15, screw cap. Advertised on the label as “The best Pinot Noir you can afford to drink daily.” · Very ripe, jammy dark fruit is featured with a noticeable amount of oak running through from start to finish. Some interesting green tea and tangerine peel flavors. Very smooth on the palate with admirable acidity. 14.1% alc., $16. · Medium reddish-purple robe. Restrained nose that never really delivers much more than demure raspberry cream aromas. Light and soft raspberry and cherry fruits with a hint of citrus presented in an elegant fashion. Very demure in nature, almost too shy in flavor impact. 13.5% alc., $17.50. · Plenty of oak char and smoke create a stinky nose. Smoked and roasted black cherry and raspberry fruit with a slightly hot finish. Only for those with a fire and smoke fetish. Barely passable. In the midst of a recession, the cost of making wine continues to go up. Price increases from growers, escalating barrel and packaging material costs and rising transportation costs continue to pressure producers to raise their prices. Some wineries may have to lower prices and take less profit, something I have rarely observed in the domestic fine wine retail market. Some retailers tell me the market for over $50 Pinot Noir has dropped off significantly. As the 2007 vintage wines begin to appear, inventories will have to be pushed through the marketplace and significant discounts may become commonplace. Next year at this time I may be writing the same article but featuring many more good wines under $20.